Charlton Athletic Women were the only side left from outside the FAWSL left in the FA Women’s Cup reaching the last 8 a great achievement for the side leading the FAWPL Southern Division going into the quarter final on Sunday up against 14 times winners of the FA Women’s Cup, Arsenal Women at Borehamwood. Postponed from last Sunday it was a special occasion for Charlton Athletic striker, Kit Graham making her 200th appearance for the club. A big test up against Arsenal the FAWSL club taking an early lead in the tie awarded a penalty in the 4th minute, Scottish International, Kim Little stepping up to score. Arsenal created further chances throughout the 2nd half Charlton working hard in defence keeping the score down to 1-0 at half-time. 10 minutes into the 2nd half Arsenal doubled their lead Heather O’Reilly sending the ball home to make it 2-0 then 5 minutes later it was 3-0 to the hosts with Dutch International Vivianne Miedema scoring the goal. As Charlton Athletic began to tire towards the latter stages of the match Arsenal took advantage to further extend their lead in the final 5 minutes with England’s Danielle Carter and Jordan Nobbs both getting their names on the scoresheet to send Arsenal into the semi-finals. An away trip to Everton Ladies awaits on the 15th April with Chelsea Ladies at home to Manchester City Women in the other semi-final and for the 1st time in history both games will be shown live by the BBC. At last Coventry United Ladies got to play their semi-final in the FAWPL Cup on Sunday after several postponement due to the weather and other fixtures. A long trip up to Lancashire to play Northern Division side Blackburn Rovers Ladies the winner meeting Leicester City Women in the Final. Keeley Davies getting the goal to put Coventry United into a 1-0 half-time lead. A screamer into the top corner from Helen Dermody in the 2nd half doubling Coventry United’s lead before Saffron Jordan pulled a goal back for Blackburn Rovers with 20 minutes left. The host pushing hard for an equalising goal broke Coventry United’s resistance in stoppage time Jordan with her 2nd of the match to take the tie into extra-time. A tense half hour followed with neither side able to win the game in open play the tie heading to penalties, heartbreak for Coventry United joy for Blackburn Rovers as they won the shootout 3-2 to reach the FAWPL Cup Final. With Charlton Athletic Women in action in the FA Women’s Cup this Sunday it was another opportunity for 2nd & 3rd placed Crystal Palace Ladies and C&K Basildon Ladies to move back above them at the top of the Southern Division table. Crystal Palace making to trip down south to play Portsmouth FC Ladies. The visitors celebrating an early goal and a fabulous milestone too for Crystal Palace’s Gemma Bryan as she scored her 100th goal for the club. Ellie Bailes also on target in the 1st half to make it 2-0 to Crystal Palace who were awarded a penalty as the game closed in on the half hour, Bryan stepping up to score her 2nd of the match. 3-0 the advantage at half-time Crystal Palace made sure of the win extending their lead with 20 minutes left, Bryan going on to complete a hat-trick taking Crystal Palace back to the top of the Southern Division table. C&K Basildon Ladies were also on the road travelling to Wales to play Cardiff City Ladies the 3rd placed side taking the lead with Paige Wakefield on target. 1-0 became 2-0 with Therese Addison putting the ball past the keeper. Cardiff City getting it back to 2-1 before the half-time whistle. A diving header from Angela Addison restored Basildon’s 2 goal lead. Again Cardiff City pulled a goal back to make it 3-2. Wakefield scoring her 2nd of the match to make it 4-2 and see Basildon win all 3 points taking them into 2nd position in the table. Sophie Thomas and Cori Williams scoring the goals for Cardiff City. At home in the league for the 1st time since November, Chichester City Ladies were hosting Gillingham FC Ladies in the Southern Division this Sunday. The sides going in all square at the break a single goal was enough to secure all 3 points the goal for the hosts with Jess Lewry sending the ball into the back of the net on the hour to put Chichester City in front and seal the win. Fourth placed Lewes FC Women were also finally back in league action after cup competitions had kept them busy since the end of November. At home were taking on Queens Park Rangers this Sunday. Chances not taken it looked as though the sides would be going in level at the break, Lewes breaking the deadlock with a minute of the first half left to play, Rebecca Carter with her 11th goal of the season. Danielle Lane doubling Lewes lead 10 minutes into the 2nd half. The result made comfortable midway through the 2nd half as Sarah Kempson put the ball home to make it 3-0. West Ham United Ladies excellent form in 2018 continues as they extend their unbeaten run to 9 games, a fourth straight win this Sunday away to bottom side Swindon Town Ladies. A narrow lead for the visitors at half-time Leanna Mabey with the goal. A blistering start to the 2nd half with youngster Kelly Wealthall netting with 22 seconds after kick-off to make it 2-0. Ellie Zoefpl scoring on 65 minutes to extend the lead to 3-0. Molly Clark then scoring to make it 4-0 her first goal for West Ham United. Weathall getting her 2nd of the game for a 5-0 lead with Zoefpl also getting her 2nd of the game in the final minute to see West Ham United win 6-0. Plenty of action too this Sunday in FAWPL South East Division One. 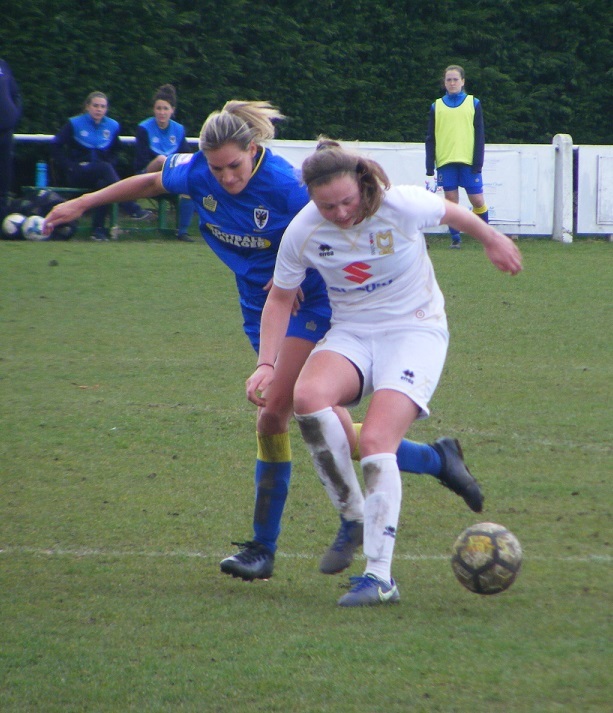 League leaders AFC Wimbledon Ladies were a massive 16 points clear at the top of the table as they travelled to rivals Milton Keynes Dons Ladies on Sunday the 4th placed side with plenty of games in hand could yet catch AFC Wimbledon if they could claim maximum points in the run in. Women’s Football East was there to see all the action and the full match report can be found under this post. A competitive and tense affair between two committed sides had a derby feel to the match neither wanting to give anything away led to few opportunities being created in the final third the sides going in all square at 0-0 at half time at Newport Pagnell FC. The deadlock broken early in the 2nd half the high tempo pace of the 1st half continuing Milton Keynes broke the ball out to striker Heather McDonnell moving wide left good hold-up play drawing players towards her the cross whipped into the box found Kim Farrow running in on goal her header taking the ball wide of the keeper into the back of the net to make it 1-0 a goal on her debut for the club. Milton Keynes working hard at the back and midfield to keep AFC Wimbledon at bay the visitors pushing for an equaliser striker Caroline Bisson coming closest putting her header just wide of the near post. Milton Keynes winning the game 1-0 move up into 3rd position behind Leyton Orient WFC. AFC Wimbledon despite the set back remain 14 points clear at the top of the table. Leyton Orient WFC took all 3 points ta home on Sunday to climb above Ipswich Town Ladies into 2nd spot in the FAWPL South East Division One table. Were hosting Norfolk side, Norwich City Ladies. Leyton Orient getting off to a fantastic start going 1-0 up inside the 1st minute top scorer Sophie Le Marchand on target. 10 minutes later Leyton Orient were presented with an opportunity to double their lead from the penalty spot Le Marchand stepping up to put the ball into the back of the net for 2-0. Le Marchand then completed a 1st half hat-trick with 4 minutes left to play to take her onto 22 goals for the season and see Leyton Orient leading 3-0. Norwich City pulled a goal back 7 minutes into the 2nd half Millie Daviss scoring to make it 3-1. On the hour Hayley Barton got on the scoresheet for Leyton Orient to see them lead 4-1 and go on to claim all 3 points. It was 5th versus 6th as Luton Town Ladies travelled to Cambridge United WFC on Sunday 2 points between the sides. Luton Town creating several chances in the first half but unable to breach the Cambridge United defence. The hosts continued to defend well 2nd half, going in front with Amber Cantwell scoring the goal it was enough for Cambridge United to win the match and as a result move above Luton Town into 5th position in the table. The battle in mid-table looks incredibly close with Stevenage Ladies continuing their recent good form to close the gap to 6th placed Luton Town to just 2 points. Fresh from winning the Hertfordshire Women’s County Cup Stevenage were on the road at the weekend taking on bottom side, Haringey Borough Women. Leah Littlechild top scoring in the game got 4 more goals to her name taking her onto 14 for the season. Not quite enough to make her top scorer but amongst the contenders, Amy Makewell was also on target for a goal to take her also onto 14 but a brace from captain Donna McGuigan keeps her nose just in front with 15 so far this season. Goals to for midfielders, Chloe Gunn and Amy Josland along with an own goal to see Stevenage win 10-2. Shanice Nourrice and Jonea Peter on target with a goal each for Haringey. Actonians Ladies were back in league action for the 1st time in a month at home to Denham United Ladies on Sunday. A goal from Alessandra Barreca late in the 1st half seeing Actonians leading 1-0 at the break. A close contest it wasn’t till the final 10 minutes before Actonians made their lead more secure Barreca on target for her 2nd went on to complete her hat-trick 3 minutes into stoppage time scoring from the penalty spot to take her onto 17 goals for the season. This entry was posted in FA Women's Cup, FAWPL Cup, FAWPL South East Division One, FAWPL Southern Division, The Round-Up and tagged FA Women's Cup, FAWPL Cup, FAWPL South East Division One, FAWPL Southern Division, The Round-Up on March 27, 2018 by WFEast.